If you’ve ever thought “I could do atriathlon…if I didn’t have to swim,” you’re not alone! The swim causes more anxiety and keeps more potential triathletes from trying the sport than either the bike or run. When the swim leg takes place in open water, away from the comfort of a warm pool and lane lines, these anxieties are often amplified. So how do you overcome your fears to survive (and maybe even enjoy) your first open water triathlon? For starters, you can learn from mistakes I made during my first race. I tackled my first triathlon at Sand Hollow Reservoir. I came from a swimming background and felt confident in the pool. At the time, I had no idea how different open water swimming would be from pool swimming. The water was colder, rougher, and murkier, and I felt disoriented for the first half of the swim. One of the challenges of open water swimming is learning to adapt to these differences. Spend more time outside in the water and you’ll feel less anxious and more prepared when the gun goes off. Luckily, in Utah we have several options for open water training. Newbies should try the Blackridge Reservoir in Herriman. It’s small and shallow with no motorized boats. You can find a list of other popular places to swim on the Salt Lake Open Water website (saltlakeopenwater.com/Swim_Locations.html). At my first tri, I wasn’t prepared to swim in the middle of hundreds of other people. All of my training had been in a pool, often in a lane by myself. When the race started, I found myself getting unintentionally elbowed and kicked by swimmers around me. More than once I got a mouthful of water when I took a breath. Prepare yourself for this by swimming with others. 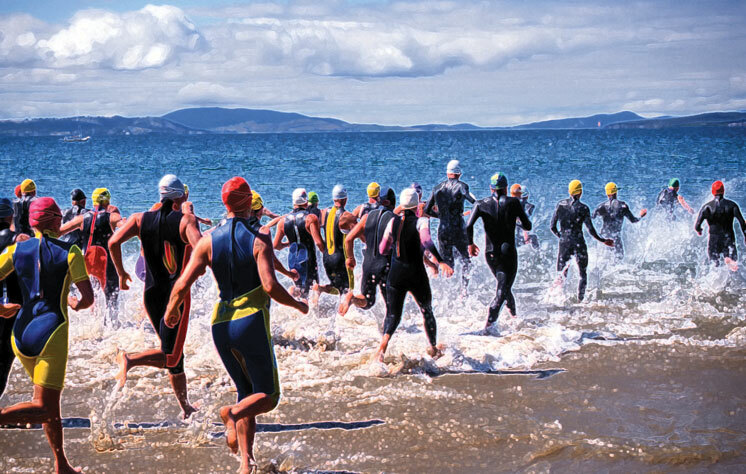 Utah is home to several active triathlon and swim clubs that hold regular group training swims during warmer months, find one for you in our resource sidebar. Also, many triathlons offer clinics a week or so before the race that include simulated starts as part of the instruction. Check with your planned race to see if they offer any pre-race clinics. Until the weather warms up, swimming three wide in one lane at the pool will give you a good feel for what it’s like to swim in close quarters. Most triathletes wear a wetsuit during the swim. A wetsuit keeps you warm, but also helps you swim faster by making you more buoyant. I rented a wetsuit online and didn’t try it on until I was at my hotel the night before the race. I was surprised by how tightly it fit and how much it restricted the movement of my arms. Settling into my normal stroke during the swim was difficult because I wasn’t used to how the wetsuit changed the way I swam. If you plan on wearing a wetsuit, rent or borrow one a few weeks before your race so you have a chance to swim in it and adjust to the new feeling. Be sure to choose a wetsuit designed for swimming and not for other watersports. It should have thinner material through the shoulders to allow for better movement. Local shops like Salt Lake Running Company and Wasatch Running Center can help you find the right size and offer weekend rentals for about $40. There are no lane lines and no black lines on the bottom of the lake to follow, so it’s easy to swim off course or in the wrong direction. I ended up swimming more than the 750-meter course in my first triathlon because I kept swimming back and forth, stopping every few strokes to figure out where I was in the water. To swim straight you’ll have to learn to “sight”. “Sighting” simply means lifting your head slightly out of the water to spot a turn buoy, or other landmark, to get your bearings. There are good videos on YouTube that show sighting technique in action. My favorite video (youtube.com/watch?v=v0-lP3exIfc) also has other tips to keep you swimming in the right direction. It’s not uncommon for beginner, and experienced, swimmers to occasionally panic during the swim. If this happens to you, roll onto your back or switch to breaststroke and take deep breaths until you feel ready to continue. Keep in mind that there will be support boats in the water, ready to help if needed. Despite my mistakes, I got hooked on open water racing after my first race and started looking for another one as soon as I got home. If you’ve been thinking about trying a triathlon, don’t let the swim scare you. Following these tips will give you confidence to enter, and finish, your first race. Who knows, maybe you’ll get hooked too! Josh Green lives in Salt Lake City with his wife and three young boys. He has been swimming practically since birth and got addicted to open water after his first triathlon. He shares his adventures and love of open water on his blog (utahopenwater.com).